All of the Lawers hills can be completed in one long traverse, but my walking mate for the day was in no mood for an extravaganza. 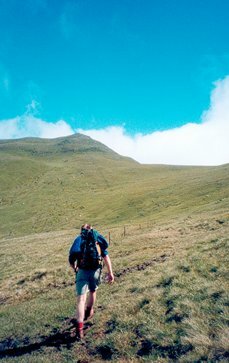 So, if it's a short hill walk you're after, taking in a couple of munros, these two hills provide just enough to meet your needs. While the hordes will have taken the "motorway" up Ben Lawers, these 2 hills offer a little more solitude and a lot less walking traffic. Weather permitting there are good views to the east towards Lochan Daimh, and the walk also gives a craggy perspective on the rest of the Lawers ridge to the east. There is enough parking space for 3 cars at the cairn (multimap), and if you're too late more parking space is available at the head of Lochan na Larige. From the cairn, follow the rough track east across the peat bogs. The track eventually runs along side some fence posts which lead directly up the grassy slopes to the summit of the first munro Meall Corranaich (1069m, GR616410). If it's windy dont expect much shelter behind the summit cairn..... there's not much to hide behind. From Meall Corranaich follow the gentle ridge north and be sure to follow the ridge NNE to make your way to Meall a' Choire Leith. The main ridge NW should be avoided although everyone that we met had drifted off some way along this ridge before discovering their error.... and this was on a clear day. Once on the correct bearing, it's a gentle climb north from the col to the summit of Meall a'Choire Leith (926m, GR613439). From the summit head SWW down the steep grassy slopes to the burn (there is a sketchy track most of the way).